Want to be notified of new releases in nmnellis/vistio? 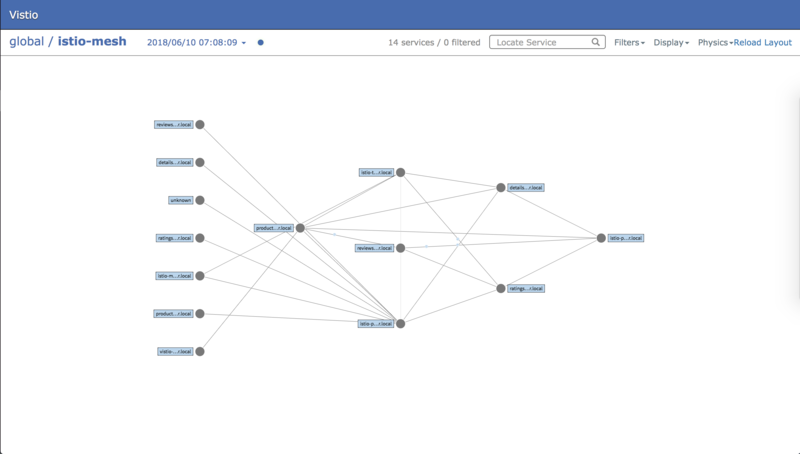 Vistio is an application that helps you visualize the traffic of your cluster from Prometheus data. Vistio-API: retrieves data from Prometheus servers, aggregates them and provides an API to get the graph data. Vistio-Web: Forked from Promviz-front: based on Netflix's vizceral to render traffic graph. Docker images of both vistio-api and vistio-web are available on Docker Hub. prometheusUrl - the default prometheus url is assumed to be http://prometheus.istio-system:9090 based on the Istio deployment. If your Prometheus server is in a different namespace or has a different service name, you will need to edit the yaml files. See configuration.md in documentation directory. Cannot Zoom into clusters - If you are having trouble connecting your clusters to the global view, make sure the target values in the global configuration matches the cluster level name. Please feel free to create an issue or pull request. Vistio is released under the MIT license. See LICENSE file for details.